» Mexico's cost of living vs income - How do they do it? Recently I saw a breakdown of the cost for Mexicans to live with the basic needs in Mexico and I wondered how do they do it? How do the majority of people in Mexico live with the cost of living so high relative to their incomes? I began to wonder what is "Middle Class" in Mexico? What the problem in Mexico is, there is a great disparity between the mass population of poor and the extremely rich. In a report by INEGI (Instituto Nacional de Estadistica Geografia) in 2015, it is stated that if you earned more than $1,250 USD ( $12000 pesos) a month you were in the upper 2.5% of the population along with Carlos Slim the richest man in the world! For this reason in Mexico, it is very hard to determine what is the middle class. From “El Daily Post” Sept 21, 2015 “The gap between the rich and poor has increased so much in recent decades that Mexico is ranked dead last in income equality among OECD (Organization for Economic Cooperation and Development) nations. It is a country that's home to the richest man in the world and to 61 million others who cannot afford a minimally decent standard of living. In Mexico, the richest 10 percent earn 30.5 times more than the poorest 10 percent. Using that measurement of inequality, Mexico is the most unequal of the 34 nations that make up the OECD”. Now this report shows a cost of living that is not accurate for most of Baja because the cost of living for example in Los Cabos is considered to be the highest in all of Mexico. Also in most of Baja in or near the cities Mexicans do earn a lot more than the average minimum wage. 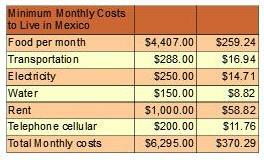 How do Mexicans survive when the daily minimum wage is $73.04 pesos a day. 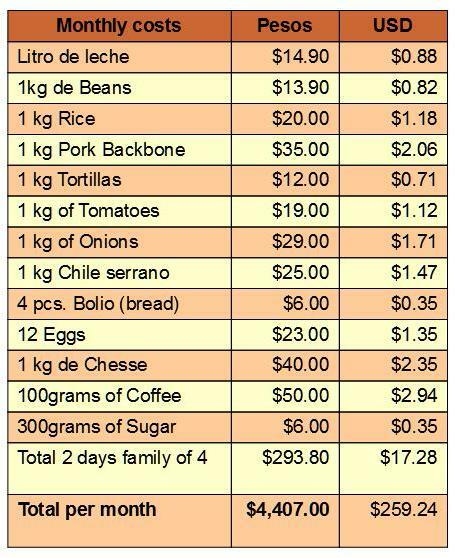 If you figure out the monthly costs for basic needs for a couple with 2 children it adds up to approximately $6295.00 pesos a month. As you can see in these tables the amount of income one would need to survive at the poverty level in Mexico is almost 3 times the minimum wage for an entire month with no days off. These costs also does not include costs for sickness, car, clothes, entertainment, meats or seafood and children walk to school. Now, remember these prices and income are an average for all of Mexico. Those that live in the most expensive area of Mexico such as Los Cabos, obviously need to make even more. You can see in the figures used in the table, that rent is $1000 pesos a month and I don't believe there are many places available for that price in Los Cabos or the border towns other than maybe a room in a house. An educated bi-lingual employee with at least a high school education and a good job in Los Cabos or near the border in Tijuana, Mexicali or Ensenada can make upwards of $1000 USD a month. Now if their rent is approximately $400 USD a month so you can see there still is not a lot of extra income for luxury items or vacations. In major cities like Mexico city, Guadalajara or Monterrey, for example, it may be a bit less expensive, living on less than $600 USD a month is very difficult, yet many do. So how do they do it? Most families have at least two incomes with extra income from children working, extra jobs or side businesses to help make ends meet. Single people, many times have a side business or hold two jobs in order to get a little ahead. I do have Mexican friends that live in rural areas of Baja or in very small rustic block homes in the cities on incomes of $600 a month. In some studies, this is considered to be “middle class” in Mexico but in most cities this is not much more than basic survival. In 2014 INEGI reported “The average household income is 13,239 pesos ($843) a month and 39,719 pesos ($2,529) per quarter. “ Mind you that is per household and not per person. 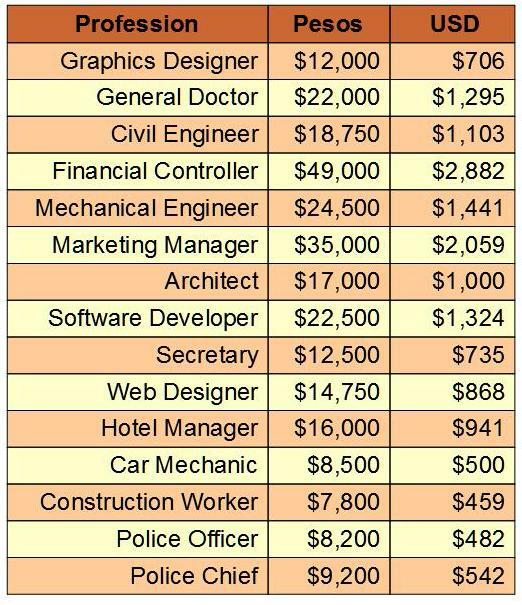 I did a quick look at jobs offered on the Internet as well as a few sites that show incomes for different professions. These are overall average incomes for these professions averaged over the entire country. I would make an educated guess that most of the salaries are 25%-40% higher in Baja cities. As you can see a doctor does not necessarily earn that much but I know a few surgeons in Baja that earn more like $5000 USD per month. I have a friend that works in a bank as a currency trader and he can earn from $3000 to $5000 a month, he says. These people speak English perfectly and live in the Los Cabos or Tijuana area and earn the highest salaries for their profession in Mexico. The “Middle Class” of Mexico is said to be growing with lots of new companies from other countries moving in. The level of education has been increasing and there are more jobs than ever but when you see how large the class of “poor” still is there is a lot of room for growth. The disparity has grown even more in the past years but that si because the rich has become much richer. According to Forbes magazine in the last 18 years, the 15 richest Mexicans income has grown 4.5 times! From 25.6 billion U.S. dollars to 142.9 billion U.S dollars and no one else's incomes have grown even close to that figure. If you are making plans to open or do business in Mexico be aware of all costs of employment such as taxes, insurance and possible housing allowance. You may think you can hire someone really cheap but there are additional costs and in most professions and areas of Mexico they do not work for the minimum wage. Relative to other countries they do work for much less but the salaries will be different in different areas of Mexico. When visiting or living in Mexico keep this in mind. Paying a little more for a job or paying a bonus for a job well done goes a long ways. A little extra for a tip or giving away used clothes and household goods is greatly appreciated. So while you are traveling, vacationing or living in Mexico remember that the average Mexican earns a lot less relative to their basic cost of living and can use all the help they can get. When you have clothes, appliances, tools or furnishings that you are not using find someone to give or sell them cheaply too. I give away clothes every year to different organizations and some of my employees. While I could possibly sell them I feel it is a great way to share a little of what I have.